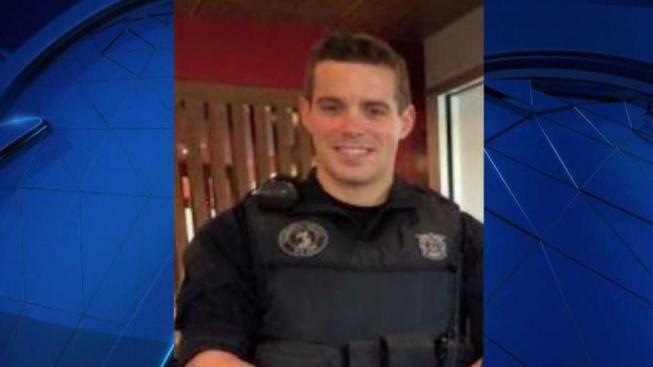 Officer Sean Gannon, 32, a member of the K-9 unit at the Yarmouth Police Department, was shot and killed while serving a warrant at a home in the Marstons Mills area of Barnstable. The wife of the Yarmouth K-9 police officer who was killed in the line of duty published an op-ed Thursday ahead of the anniversary of her slain husband’s death. Dara Gannon, the wife of 32-year-old Sgt. Sean Gannon, begins her op-ed in the Cape Cod Times by thanking the community for their outpour of support following her husband’s fatal shooting. She notes the multiple letters, drawings and homemade meals she received following the tragedy. "For all of that, and for so much more, I am eternally grateful," Dara Gannon said. Gannon was shot and killed last year on April 12 when he was serving a warrant at a Cape Cod home. He was taken to Cape Cod Hospital, where he died. Gannon’s K-9, Nero, was also shot and underwent emergency surgery. He has since recovered. Dara Gannon advises anyone who wants to remember Sean to do so by reaching out to their loved ones or helping others. From turning a wrong into a right, paying for a stranger’s coffee or simply saying hello to an old friend, Dara says "no gesture is too small." "We each have a special gift," she wrote. "Please use yours for someone else. I feel that is Sean’s legacy." The slain officer was posthumously promoted to sergeant on the day of his funeral. He joined the Yarmouth Police Department in 2010 after being a campus police officer at Stonehill College for three years. The gunman who shot Sgt. Gannon, 30-year-old Thomas Latanowich, was indicted in the officer’s murder and eight other charges.